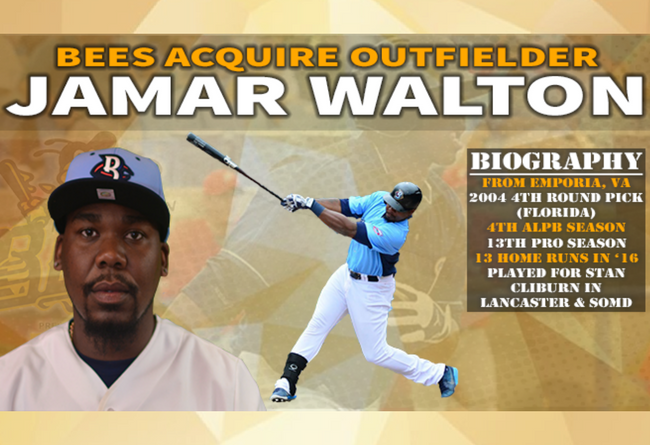 (New Britain, Conn., March 2, 2017) - New Britain Bees team officials today announced that the team has acquired outfielder Jamar Walton from the Southern Maryland Blue Crabs in exchange for future considerations. In a corresponding transaction, the Bees have signed Walton to a contract for the 2017 season. Originally drafted in the fourth round of the 2004 MLB Amateur Draft by the Florida Marlins, Walton has spent the last three seasons in the Atlantic League with the Blue Crabs and Lancaster Barnstormers, helping the Barnstormers to a 2014 ALPB Championship and returning to the championship series with the Blue Crabs in 2015. The Emporia, Virginia native spent seven seasons in affiliated baseball, with stops in the Marlins, Royals, and Nationals organizations. Last season, the left handed hitting outfielder appeared in 122 games for the Blue Crabs, and hit .284 with 13 home runs and 49 RBIs. Walton is reunited with Manager Stan Cliburn, who was his hitting coach in Lancaster (2014) and manager in Southern Maryland (2015), along with former Blue Crabs teammates Jovan Rosa and Craig Maddox. In 13 professional seasons, the 31-year old Walton has appeared in 945 games and has tallied 894 hits, including 153 doubles and 32 triples. The 6-foot-4 outfielder has experience at all three outfield positions, but has primarily played left and right field over the last two seasons. The New Britain Bees are members of the Atlantic League of Professional Baseball, playing all home games at New Britain Stadium. Individual game tickets for the 2017 season go on sale at New Britain Stadium starting on March 18th at 10 am. Season Tickets and Mini-Plans are available by calling 860-826-BEES (2337), online at NBBees.com, or by visiting the New Britain Bees’ Front Office.